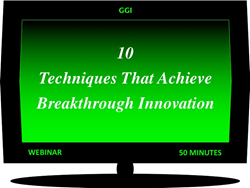 10 Breakthrough Innovation Techniques that increase corporate innovation performance in a one-hour webinar. Very professional, well structured, well thought out. Excellent linkage to the study of management science for R&D/innovation. Clayton Christensen introduced "Disruptive Innovation" to the business world in the mid 1990s. Companies, thought leaders, and academics have now been applying and fleshing-out that basic disruptive concept for over two decades. Disruptive products and technologies change some small part of life. They often arrive out of nowhere. Mostly, the disruptor takes over the field and all competitors need to react and adapt. Rewards are big. Risks vary greatly. GGI recently examined the various approaches that have evolved these past twenty years. We identified 10 differentiable strategies that achieve breakthroughs and disrupt at some level. Each approach is different and novel, but all portend leapfrogging. Each will be briefly codified and analyzed as a management science. We will discuss shades of gray. How new is "new-to?" And, we will address difficult questions. Is breakthrough a next generation, or beyond? Does disruptive differ from transformational? Or radical? Each of the "10 "Breakthrough Techniques" will be contrasted to the varying degrees of new-to, stretch, and disruption. We'll conclude with a brief section on commercializing breakthrough products that may be ahead of their time, and a Q&A session. Learn benchmarked techniques corporations are using to drive breakthrough innovation. Discover R&D strategies that embrace and facilitate disruption. Explore ten differentiated approaches for creating new-to-the-world products. Understand corporate resource and portfolio allocations to produce breakthrough results. Learn how to overcome pitfalls and risks when commercializing disruptive products. Behold the possible financial returns for disrupting and breaking-up markets. The goal is to share an intellectual hour discussing findings with corporate leaders on the subject of breakthrough innovation in corporations and literature, with no analytical spin or promotion by GGI. References to all cited materials are provided in sufficient detail to enable participants to follow-up on approaches that might be possible in their corporate environment. Founded in 1986, GGI has consulted to over 200 medium and large companies. Some 500 companies have participated in GGI's educational events. Since 1998 the company has performed primary and secondary research on R&D, product development, innovation, and metrics. With several hundred published articles and research reports, and an equal number of public and conference presentations, GGI is well qualified to offer value-added one-hour webinars to innovation leaders and practitioners in corporations. For the past five years, Mr. Goldense has written "Goldense on R&D-Product Development," the inside back page article on engineering strategy and management for Informa's monthly Machine Design Magazine. He is a frequent speaker at the International Forum on Design for Manufacture and Assembly over three decades, and at the R&D 100 Conference that is held in conjunction with the R&D 100 Awards each year. Brad is a new member of the judging panel for Design World's Leadership in Engineering Achievement Program (LEAP) Awards.